The #1105 (1968-1971) Straight Hair TNT version wore a striped suit. It came in 3 versions. The very hard to find pin-striped version is from the first issued dolls. The wider striped version came out late in 1968. Then a even darker version came out after that. 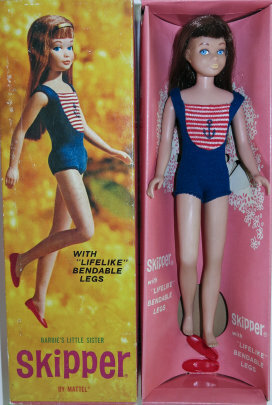 The later dolls were "Made in Taiwan" and the earlier dolls were "Made in Japan"
The Straight-hair TNT Skipper are often found with light color faces. The vinyl is prone to fading over the years. The box includes #1030 Bend-leg Skipper dressed in her blue swim-suit, red flat shoes, brass headband, with white plastic brush & comb, black or gold wire stand, and booklet. 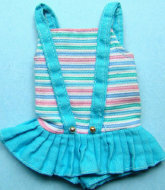 #1105 TNT Skipper comes dressed in a one-piece turquoise & pink swimsuit, turquoise headband with plastic X stand, and booklet. Sausage curl wears a orange colored swim-suit.